So much has been going on in my world and my heart and my head that I really haven't been able to settle down this week and read as much as I'd planned on reading. My next book was supposed to be a simple, straightforward non-academic easy read love story. I thought I'd finish it by Wednesday. I was wrong. I carried this book around for two days before I could read it. I put it next to me while I graded exams, and I carried it to my office and class and never opened it because being on campus right now is too intense in ways I can't especially articulate. So today, Friday the 13th, the day of some crazy summer honey moon that won't be back until 2098 etc, I read this book from cover to cover. The first half didn't hook me. Seriously. A man, A woman. Dogs that get pregnant and roll in smelly things. 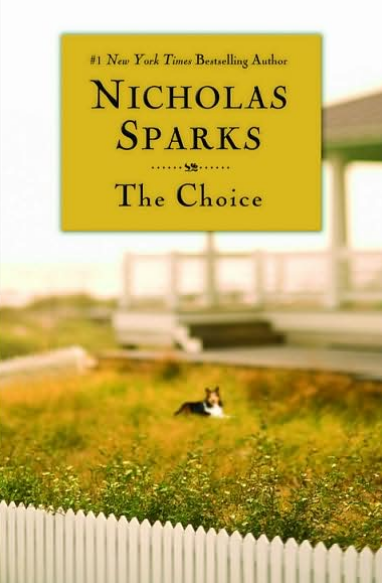 One of them has a significant other, hence the title "The Choice. " In all honesty the first 170 pages of this book didn't really hold me, pull me, grab me in any way. And then in one second the story pivoted like a horror-love story and "The Choice" became an entirely different choice, framed in this particular question, "How far should a person go in the name of true love?" This book turns from a run of the mill love story to an epic fairy tale in three single beats. This G rated fairy tale love story will keep your attention for a long car ride or a plane trip somewhere.